The Schneider 100mm T2.1 Xenon prime lens is specially designed for digital cinematography on full-frame digital SLRs. The circular 14-blade aperture is specially engineered for a smooth and consistent bokeh. The precision constant volume focusing design ensures that breathing is minimised and with a 300-degree barrel rotation, the manual focus markings ensure precise, accurate focusing. Additionally all lenses are colour-matched for consistency. 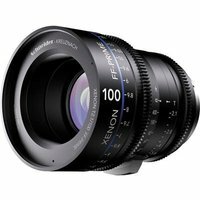 Engineered for compatibility with industry standard cine-style accessories like follow focus rigs and matteboxes, the Xenon full-frame lenses feature identical external dimensions and positioning of focus and gear rings in each focal length.